It always feels good when you can add something to the house that is decorative rather than necessary. Last week was Steven's birthday so I bought him a large painting and in a sort of BOGO way I treated the den to a smaller one too. 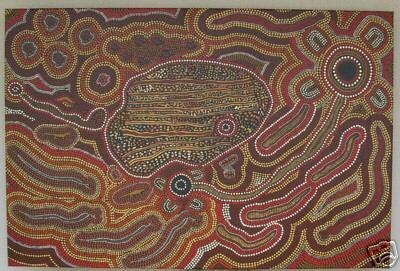 They are aboriginal paintings from Queensland, Australia. One depicts the Myths of Uluru and the smaller one is a Cod Fish. We have placed the large one on the sandstone wall, both because it was a large bare space and because I think the dot painting needs to be in a sandy setting reminiscent of the earth. The Cod Fish I couldn't resist because it is black and red, which are the colours we used in the den. I think they look awesome, but I am not sure Steven shares my enthusiasm. One reason I picked Australian Aboriginal art is that with the new roof we have to put on the house this Spring I am pretty sure we will not be going to Australia as planned to celebrate our wedding anniversary. I thought this would be a nice way to get in touch with Australia but maybe I put way too much thought into this present? 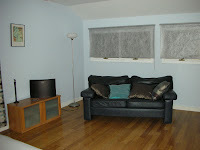 We also have blinds in our bedroom now. Steven went to London for a conference and stopped by Habitat to pick up these incredibly cool silver blinds that look like gossamer. Customs gave him a bit of grief as he had to carry two 6' tubes back to the US: they wanted to know if there were no roller blinds in the US. Of course there are but they are all disgusting, old-fashioned and vinyl. Anyway, they are up now and the bedroom is almost done. Plus our neighbours can no longer see right through the house into our room in the winter. We'll get some blinds for the downstairs bathroom so guests can take a shower without shocking the new neighbours next door but once the leaves are back on the trees it isn't urgent as they provide a natural screen.